The MFC-9010CN is a compact and affordable digital color all-in-one solution that combines printing, copying and scanning into one powerful space-saving device. 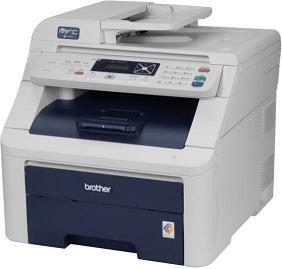 It produces brilliant color output and offers stand-alone copying as well as copy reduction or enlargement from 25-400%. Additionally, it provides high-quality color scanning and supports a variety of 'scan-to features. Use the 35-page capacity auto document feeder for copying or scanning multi-page documents quickly and easily, up to legal size. This all-in-one also provides flexible connectivity with Ethernet and Hi-Speed USB 2.0 interfaces. High-quality color scanning. Up to 19200 dpi (interpolated), with a variety of "scan-to" features.